Spindrift Brewing – Now Open in Dartmouth, N.S. Spindrift Brewing Co is a new brewery in our region, a partnership between co-founders Andrew Bell, Andy Armstrong, and Rob Green. Their Coastal Lager has been available at NSLC locations across the province since mid-September, and this week they will be celebrating the Grand Opening of their storefront at 21 Frazee Drive in Dartmouth. Kellye Robertson heads up the Brew Team, and brews on a DME Brewing 20bbl (24hl) 3-vessel system. Co-Founders Andrew Bell, Andy Armstrong, and Rob Green were kind enough to answer some questions about themselves and the brewery. Andrew Bell – Co-Owner of Spindrift Brewing Company, is the grandson of Charles R. Bell whom championed the St. John’s, NL based Bavarian Brewing Company with the Hickman family back in 1945. Eventually purchased by Labatt Breweries in 1962, The Bavarian Brewing Company aimed to make the best German-type and quality beer for the competitive market of the day. Bavarian produced two of the nostalgic Newfoundland beer brands, Jockey Club Lager and Blue Star Beer Lager, still in market today. For Andrew, there was a longing to pick up the brewing legacy of this grandfather, much as he has with taking over the Charles R. Bell group of companies he is now managing, and get back to his roots of making great local beer. Andy Armstrong – Co Owner of Spindrift Brewing Company has over 30 years in the beverage alcohol industry, dating back to his university days at Laurentian, where he was both Campus Rep and Summer Rep for Labatt. Ever since those early days, it has been his dream to someday open a brewery of his own… Spindrift is the realization of this dream. Andy brings a tremendous amount of industry expertise to this venture, having worked at field level, management and in an ownership capacity for the last 25 years, in Ontario, the Prairie Provinces and, Atlantic Canada. He has worked with suppliers of spirits, wines, beers and RTD, providing experience across all categories. He has successfully introduced countless brands, providing for a structured and well learned brand launch approach. He resides in Dartmouth, Nova Scotia, allowing for considerable focus and a deep understanding of the Atlantic Canada Craft Brew Marketplace. Rob Green – Co-Founder and General Manager of Spindrift was born and raised in St. John’s NL, and has resided here in Nova Scotia for over 25 years. One of the three founders of Spindrift, Rob came to the team in February 2012 after a 26 year career in the Royal Canadian Navy, and began building the dream that you see and taste today. Rob completed his Executive Certification in Brewing Technology through the Siebel Institute in Chicago (World Brewing Academy) in 2013. As General Manager, Rob is responsible for the overall operations of Spindrift, including the coordination of the Production, Accounting and Sales teams. How did you get into the world of beer/craft beer? Andrew and Andy have long been fans and followed closely the craft beer scene. They started Atlantic Spirits and Wines (ASW) together, an alcoholic beverage distribution company. After years of development of ASW, the logical next step was into the craft beer market with Spindrift, using ASW as the sales arm for the company. Many years were spend to the lead up of Spindrift. In fact, the idea for the company happened over a few beer in South Carolina with Co-Founder Rob Green back in the early days of 2011. From that moment, Andrew and Rob continued to pursue the venture, carefully laying out the business plan and the style of beer that would be Spindrifts flagship. From there, Rob completed his Executive Certification in Brewing Technology through the Siebel Institute in Chicago (World Brewing Academy) in 2013. Shortly thereafter, the location was determined and a Brewmaster found. Can you tell us about the beer(s) you plan on offering initially? Are you planning on offering a specific style, or genre (German, English, etc), of beer? Much like Jockey Club lager, Spindrift’s flagship beer is a tip of the hat to his grandfather’s enterprise. Coastal Lager is a German style Fest-bier that is bright amber in colour with a frothy head that lingers to the last drop. It has unique toasted and earthy qualities that are gained by using specialty European and Canadian malts, with noble German hops to create a very clean finish. It has an ABV of 5.0% and an IBU of 30. We’ll take the time to brew a lager the old fashioned “35 days” way. We are not going to stick to making any particular style of beer, only to making great beer that is fills a gap in the market. We’re not going to brew your everyday beer. We’re coming with something different. Spindrift Coastal Lager is available through the NSLC province-wide, and on tap select licensees. The NSLC will have single 473 ml cans priced right at $3.60 while a 4 pack is $13.99. We’ll also operate via store front at our brewery located at 21 Frazee Ave, Burnside Industrial Park, Dartmouth. Our storefront will also offer growler fills for $11, initial growler purchase of $20 (includes bottle deposit). We’ll also fill other brewery growlers for the same price, but we ain’t cleaning them. They must come in clean to be filled with our tasty brew. In addition to cans and growler fills, we’ve got samples available, as well as kegs for private sales. For licensee distribution, we’ve partnered with Bishop’s Cellar. We are currently on tap at The Argyle, Auction House, Moxie’s Bayers Lake Halifax (and Dartmouth Crossing next week), Bar Stillwell, with more licensees signing on to serve our beer constantly. Will you be releasing any seasonals, one-offs, or will you stick mainly with a “flagship lineup”? Eventually. We are just a few weeks out of the gate. We intend to satisfy the market with Coastal Lager before we embark on multiple brands and seasonal beer. More great things to come from Spindrift, that you can be sure of! We have found that the craft brewery scene in Nova Scotia is one that is very receptive to assisting each other and promoting each other. We have to give big props to John Allen of Propeller Brewery. He has been an excellent resources and mentor for us at Spindrift. John is definitely a class act. Would also like to thank PEI Brewing for hosting us to learn about their packaging system. Also a big shout out to DME in preparing us for the mechanics of our brewing system, which is quite the Cadillac! Where do you hope to see Spindrift in the next 5 years? In the hands of many loyal consumers, of course! We also caught up with Brewmaster Kellye Robertson, who shared some of her background, and more details on the brewhouse. I did start out homebrewing when I was in university, but it wasn’t until my second year into it, that I started to explore in all-grain brewing. Once that happened, it seemed like endless possibilities of styles and ingredients which really took my interest into discovering more about brewing techniques/brewing literature. I believe it was at the point where I found myself spending more time learning about brewing than what I was actually going to school for, that I needed to find out what my options were. I could have gone the “stage” route, however I really wanted a professional brewing education. Once I found out there was a new program that started in Canada (Niagara College), the rest was history. Do you have assistance in the Brewhouse? Absolutely! Every great brewery begins with having a solid team. I’ve got Kyle Jeppesen heading up our QA/QC program and also Assistant Brewer, plus Matthew Daye as our in-house “can-whisperer” aka Packaging Manager. We have an all-Canadian DME Three Vessel 20 BBL Brewhouse with their brand new integrated Siemens Braumat Compact automation program. 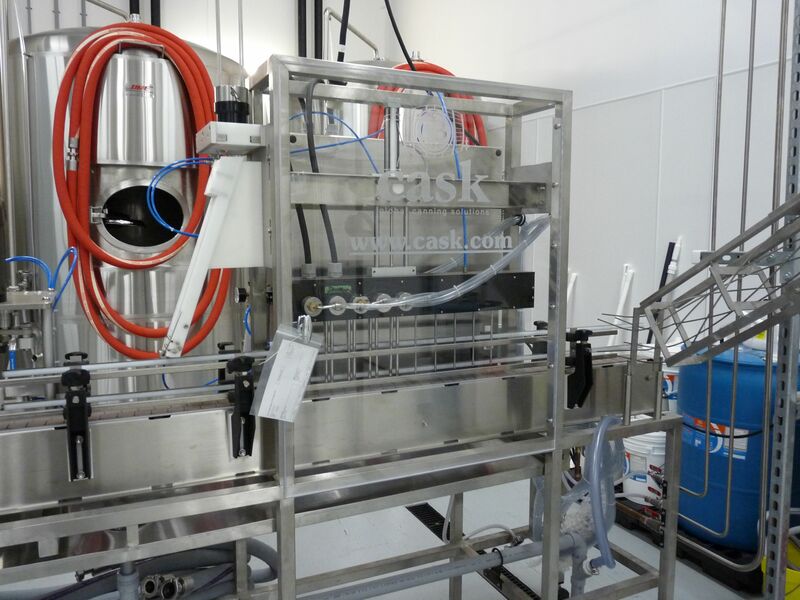 It was built to our exact specifications, all at DME’s Charlottetown facility. 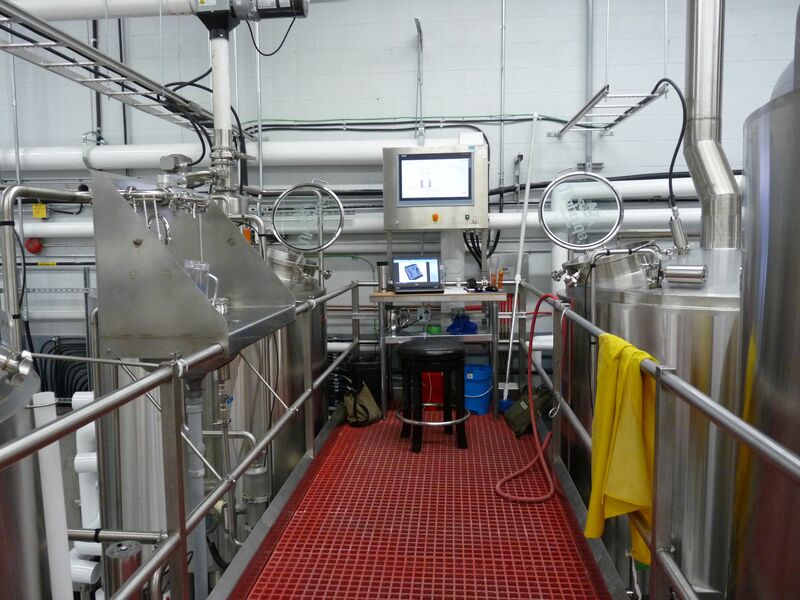 This steam-driven system features a mash tun, lauter, and kettle/whirlpool vessels. Using steam jacketing allows for great mash temperature control, very useful for step mashes. There are a few special integrated devices that we incorporated into the Braumat control which make consistency in the brewdays easier. We have 40 barrel and 80 barrel tanks for fermentation, to keep up with demand. We have a small lab where Kyle can do some micro work on our yeast, checking for health and purity, as well as testing pH, off-flavours, and forced fermentation of our brews. Our Cask Canning machine gets a workout on packaging day, with Matt in charge of that lofty task. From where/whom have you learned the most in respect to brewing? I had a lot of exceptional teachers from Niagara College that gave me a solid foundation in becoming a brewer. In addition to school, the previous breweries I’ve worked at (Beau’s All Natural Brewing, Oast House Brewers & Garrison Brewing Co) all have had a great impact on my professional career and I wouldn’t be where I am today without them. Do you have a specific ingredient in brewing that you like to brew with (whether at home or professionally)? I believe like most brewers, it’s hard for us to have a favorite anything, hah. I do enjoy experimenting with new or unusual raw ingredients, but I also respect revisiting some of the more traditional components and consider if they could be showcased in a new approach. Well lately, I have been quite taken with the lager family since it’s a style that isn’t seen as often in the craft beer, however, definitely a growing segment. My favorite go to beer I’d say is Great Lakes Canuck Pale Ale and favorite brewery without a doubt is von Trapp Brewing in Vermont. Thanks very much to Andrew, Andy, Rob, and Kellye for taking the time to chat with us. Be sure to drop by for their Grand Opening on Wednesday, Nov 4, from 11-6pm to check out the brewery and grab a growler or can to go. Going forward, the storefront will be open weekdays 11-6pm. Keep up with Spindrift on their website, Twitter, Facebook, and Instagram pages, to find out about their new releases and special events. Cheers! ← Friday Wrap-Up – New Beers from Garrison, Quidi Vidi, PEI Brewing, Picaroons, Upstreet and much more!